I use the brown baking cupcake papers that you can find in specialty stores for these, they match the professional flavor. It’s a very sophisticated treat. In a double boiler, melt the butter and chocolate , add sugar as butter and chocolate melt. Stir often until smooth . Rest chocolate mixture off the heat for 5 minutes after melted ,stirring often. Sift almond meal and cocoa powder into a mixing bowl. Add chocolate mixture. Mix on low until combined and smooth. Crack eggs into a seperate bowl and beat with fork to combine .Add vanilla. I pour 12 big cupcakes out of this recipe because of how beautiful they turn out when they are baked. But of course if you pour more, the cooking time will be less. 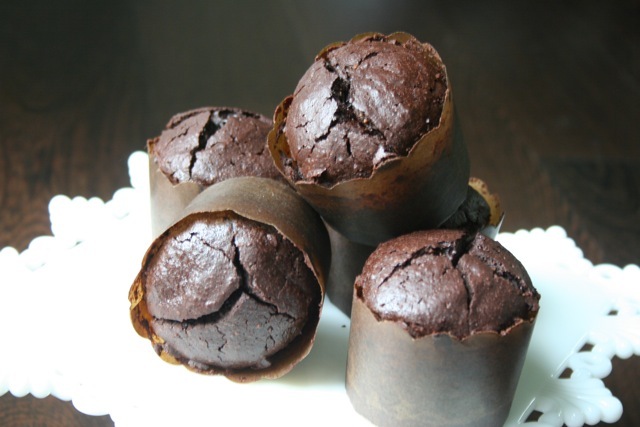 Pour into cupcake tins or papers and bake until skewer comes out clean . This entry was posted on Sunday, January 15th, 2012 at 9:16 pm	and tagged with chocolate, cupcake, desert, flourless, Flourless Chocolate Cupcakes, recipe and posted in Category. You can follow any responses to this entry through the RSS 2.0 feed. I am going to bake these cupcakes this week! Have i mentioned that i love your receipes & the photos!! thanks !!! it means a lot that you are inspired! !